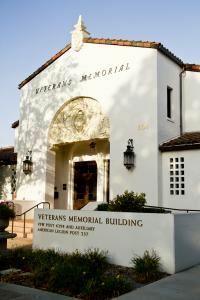 The Veterans Memorial Building in Downtown Pleasanton hosts a number of events. A Spanish Revival-style facility built in 1933 and rededicated in 2007, holds up to 220 people. It has a large (approx. 3000 square feet) main hall with a wood floor, a stage and a commercial kitchen. It is suitable for receptions, fundraisers and large meetings. Description: Large Main Hall (approx. 3000 square feet); Spanish Revival-style facility built in 1933, located in Downtown area; Very limited on-street parking Equipment: 220 folding black chairs; Thirty (30) 8-ft rectangle tables (96”x 30”x 29”) – seat 10; Two 4-ft rectangle tables (48”x 24”x 29”) Availability:	•	Friday, 6:00 pm – 12:00 midnight •	Saturday, 10:00 am – 12:00 midnight •	Sunday, 10:00 am – 9:00 pm Exceptions/Restrictions: •	Use is limited to entries, main hall, kitchen, restrooms, outside areas. •	Building Attendant(s) Required. •	Barbecues and candles are prohibited. •	No Smoke Machines. •	Room set-up limited by Fire/Building codes and group size. •	Bar service allowed only in back foyer and kitchen •	Wall decorations are not allowed.